This handcrafted, Western style coffee table will make a wonderful addition to the décor of your living room. 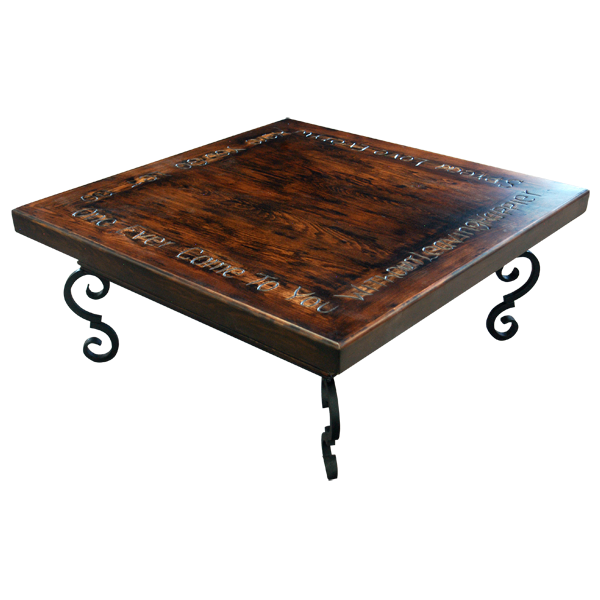 The coffee table features a robust, luxurious, square top with a beautiful, antique finish. Hand carved designs form an inner, square border on the top of the coffee table. The hand carved details can be customized, and they can be carved in any form that you would like. The top has a classic, straight, top rim, and the sides of the coffee table are covered in hand forged iron. The coffee table rest on elegant, curved, hand forged, iron legs. It is made with the best, sustainable, solid wood available, and the coffee table is 100% customizable.